A fantasy romance mystery drama with a touch of humour, Ghost hits all the right notes in the story of love's endurance despite death's interruption. In New York City, Wall Street banker Sam Wheat (Patrick Swayze) and pottery artist Molly Jensen (Demi Moore) are deeply in love and thinking of getting married. Carl Bruner (Tony Goldwyn) is a friend of the couple and Sam's colleague at work. One night after a theatre performance, Sam and Molly are confronted by a mugger, and Sam is shot and killed in the confrontation. But he is not ready to fully depart to the afterlife: he hangs around as a ghost, able to observe everything but unable to communicate. Sam's ghost is shocked when the mugger Willie Lopez (Rick Aviles) returns to Molly's apartment for an attempted theft. He realizes that the mugging was actually a murder related to money laundering at the bank, and Molly is still in grave danger. Sam connects with psychic Oda Mae Brown (Whoopi Goldberg) and she becomes his means of communication, but convincing Molly that Sam's ghost is still hovering and looking after her well-being will not be easy. Directed by Jerry Zucker and written by Bruce Joel Rubin, Ghost is a perfectly conceived and exquisitely constructed film. Finding an impeccable combination of romance, mystery, and spectral interaction with a complementary dusting of comedy, the film weaves an irresistible two-hour magic spell filled with tears and laughs. The romance elements are the powerful magnetic force at the core of the film. Ghost is first and foremost a love story about the bond connecting two people across multiple dimensions. The pottery scene set to the tune of the Righteous Brothers' Unchained Melody is the most heartfelt expression of the passion between Sam and Molly, and one of cinema's most famous romance moments. But Zucker also fills the film with wistful moments, as the lovers frequently sense each other without quite being together. Demi Moore and Patrick Swayze are both at the peak of their star power and find instantaneous chemistry. Neither will ever be accused of achieving acting greatness, but they both deliver what Ghost needs in terms of an attractive, confident couple who nevertheless have some difficulties expressing what sometimes needs to be said. Swayze of course gets several shirtless scenes, and Moore's practical yet stylish haircut is one of the most prominent symbols of the end of the 1980s. 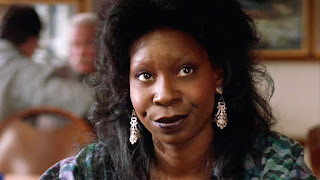 The humour arrives courtesy of the Oda Mae Brown character, Whoopi Goldberg's finest big screen role. Oda Mae is a fraud psychic when Sam first meets her, but his presence awakens her genuine ability to communicate with the dead, very much a case of be careful what you wish for. Oda Mae's shock at her newly discovered powers opens the door to plenty of comic moments, none more so than when her small but suddenly popular Brooklyn store is overrun by both grieving family members and the recently deceased. An angry ghost who haunts New York's subway cars and takes umbrage at Sam's intrusiveness injects a few more laughs of the more dangerous kind. The special effects are decent for the era, but more impressive is Zucker inserting Sam into most scenes and allowing the other characters to carry while ignoring his presence. Most of the film plays out in two dimensions at once, the real world oblivious to the presence of spirits, and yet observed by a present ghost desperate to communicate but unable to. When Sam learns the art of interacting with physical objects, the more traditional noisy apparition is suddenly explained. The money laundering conspiracy story at Sam's workplace adds an edge to Ghost, introducing nefarious antagonists and giving Sam his reason to hang around and meddle in the world of the living until the real reason for his death is uncovered and Molly is safe. Zucker also has fun showing an alternative to the bright-light-upon-death, for those whose actions mean they go down rather up at the end. Ghost is unabashedly fanciful, unapologetically romantic, and indisputably a classic.